The first annual Three Stacks Music Festival in Lansing, Michigan will feature punk and alternative rock performances from both local and international bands. Only four weeks after Fusion Shows hosted their fourteenth annual music festival BLED FEST in Howell, the Michigan-based concert promotion company will be putting on a new festival for the first time. 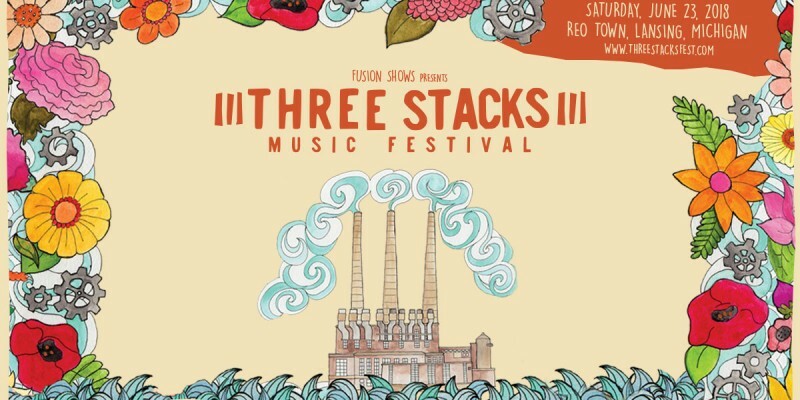 Three Stacks Music Festival is set to take place in the REO Town neighborhood of Lansing, near Fusion Shows’ headquarters. According to the festival’s website, the name was “inspired by seeing the massive man-made structures out of our office window every day,” speaking about the towering smoke stacks of the Eckert Power Plant just across the river from the festival grounds. Three Stacks Music Festival will set the stages for both local and world-renowned musical acts that span the genres of punk and alternative rock. The main stage, to be held out doors on the 1100 block of South Washington Avenue, will include notable punk bands Against Me! and PUP as well as Australian alt-trio Camp Cope and the genre-defying mewithoutYou. The Robin Theatre on the same block will host the second stage, where festivalgoers can see Michigan-based acts such as Worn Spirit of Lansing and Grand Rapids’ indie-pop outfit Secret Forte in a more intimate setting. The Robin Theatre bill can also be attended by folks not attending the festival, for ten dollars at the door. In a similar fashion, Lansing-based label GTG Records will host an after party at the REO Town Marketplace with the bill including Lansing’s The Plurals and Bong Mountain of Grand Rapids. After the last set, punk rock karaoke will also be available to attendees to close out the night. Aside from array of musical performances, festivalgoers are encouraged support the many local businesses and artists of REO Town. With the festival allowing re-entry (with festival wristband), attendees can explore the REO Town Marketplace, where a variety of Michigan vendors and artisans will be offering their expertise in part with a Three Stacks Pop Up Market. Music junkies can also check out The Record Lounge, located outside the west entrance of the festival, that specializes in new and used vinyl records. Food and drink will also be available throughout the day from local pubs and food trucks as well as Shorts Brewery, Starcut Ciders, and Faygo. Three Stacks Music Festival takes place this Saturday, June 23, and tickets are still available online or at the festival entrance. For more information on the festival including directions, ticket purchasing, and the full lineup of performances, please visit www.threestacksfest.com.